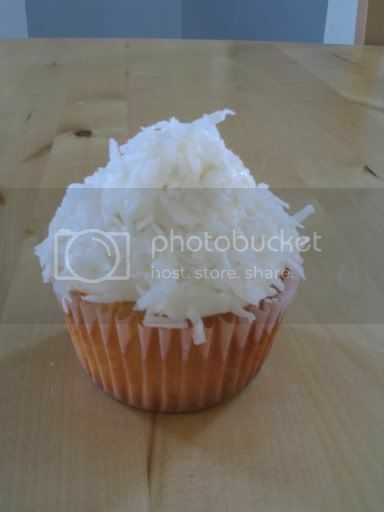 Cupcake, my love: Happy Pi Day! It's the beloved 3.14! When I was younger this was probably one of my favorite days to go to school, I always looked at the month of March in hopes that the 14th feel on a school day. Now you're probably wondering why on Earth any child would want to go to school. Well, the answer is Pi Day at school was simply that, it was Pie Day. My school would dedicate the entire day to everything pie, and hello...how much do I love pie! We would have pie walks and pie eating contests, pie tosses and pies in your face. It was simply heaven! And even though I was an undercover math geek March 14th was the one day I didn't have to be embarrassed to proclaim my love of math...because everyone else as doing it to. But after the 14th my admiration for math was again tucked away for another year. It always amazes me the traditions one carries on, especially if they were ingrained in you from a young age. 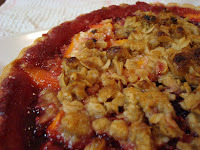 So when I began talking about Pi Day two nights ago with my boyfriend, contemplating what kind of pie to make for this glorious day I was shocked when he asked the dreaded question, "What is Pi?". My mouth almost hit the floor, I went on to explain to him my middle school memories only to get the "blank face" response. He had no clue as to what I was talking about, and here I am at 23 years old still believing that everyone celebrates Pi Day. My heart was absolutely broken. 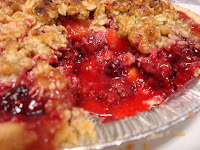 To make me feel better (and to spread the word about Pi Day), this post is dedicated to all of you out there who never had the chance to experience all the great things Pi Day has to offer. March 14th should be filled with meringues and fruits, chocolates and creams, double crusted and crumbs, piping hot and frozen pies of all kinds! 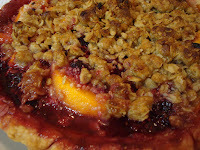 As an offering to anyones first Pi Day, I give to you Raspberry-Peach Crumb Topped Pie! 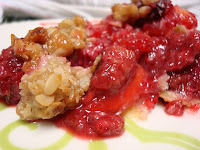 Happy Pi Day bloggers! I have never celebrate Pi day. I hope you still like me. This pie is an awesome contribution to the day.